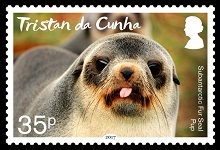 Stamps celebrating the Tristan da Cunha group's breeding population of Subantarctic Fur Seals. 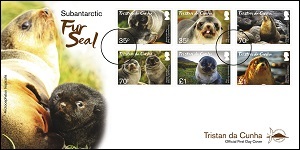 Like most oceanic islands, the Tristan archipelago supports fewer species compared to a continental landmass of similar size, and although many of the species found there are unique to Tristan, others are in extreme abundance, such as the Subantarctic fur seal, Arctocephalus tropicalis. 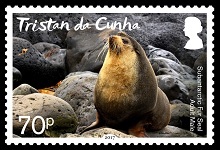 The fur seal population at Gough Island has possibly recovered to pre-exploitation levels and numbers some 300,000 animals with an estimated 60,000 pups born as an educated guess, about 80% of the world population. 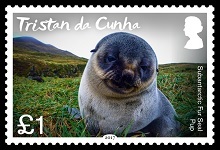 The species was extinct at the northern isles of the Tristan archipelago in early 20th century through indiscriminate sealing during the late 18th and early 19th centuries. Relatively small numbers bred at Tristan da Cunha, Nightingale and Inaccessible islands after more recent recolonization, most likely from Gough Island, and these populations are now rapidly increasing in size through intrinsic growth. They breed in congested coastal colonies, favouring jumbled rocky beaches. Juveniles and females are present year round, but males are strongly seasonal, returning October–December to compete for territories on breeding colony beaches. Females arrive soon after the males and are gathered in harems, giving birth to one black pup in late November–early January. The adult males depart to sea when the harems start breaking up in late December–early January, with some returning to moult February–March. Female feeding trips to sea are followed by visits to shore to suckle the pups throughout the long lactation period, the pups remaining at the island for 10-11 months. 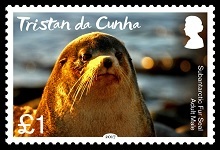 This stamp series celebrates the islands’ fur seal population, the largest in the world. 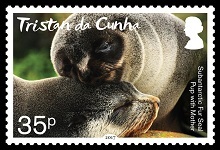 The fur seals have been investigated since 1974 at Gough Island, and from 2011 at Tristan da Cunha Island, by the Mammal Research Institute, Department of Zoology & Entomology, University of Pretoria, South Africa, under permit from the Tristan da Cunha Conservation Department, with approval by the Administrator and Island Council. Lactating female, 1.0–1.3 m, 21–46 kg, and her older pup, which grows rapidly and moults to a silver-grey coat by four months of age. Vibrissae (whiskers) in older, adult females are wholly white but are predominantly dark in immatures of both sexes. Medium-sized immature fur seal with typical lack of a clear demarcation between the dark upper parts and the pale face, throat and chest, only characteristic of older adults. Adult male, 1.5–1.8 m, 74–158 kg, with an enlarged chest and shoulders, long white whiskers and a prominent crest or tuft on top of the head. The creamy-buff face, throat and chest is diagnostic, contrasting with the darker greyish-brown crown and back. The adult female, without a prominent crest or tuft on top of the head has a more slender build than the adult males, with a creamy-buff face, throat and chest. Her pup, which she leaves periodically over a 10-11 month lactation period, to forage at sea, is partly moulted. Pups are 30–40 cm, 3–6 kg at birth with a black coat; They grow rapidly and moult to a silver-grey coat by four months; They remain at the islands until almost one year, fasting while they wait for their mothers to return from their frequent foraging trips. Russet coloured adult male fur seal in the late afternoon sun. The upper parts are usually a variable dark greyish-brown, fading to ginger on the belly and white to burnt orange on the chest, muzzle and face. 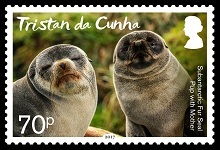 The first day cover illustration shows a mother and pup.